Treatment activism revolutionized the care of people living with HIV around the world. Today, prevention activism and advocacy are extending and complementing this ongoing work. Through strategic, uncompromising, ambitious campaigns, activists and advocates are securing funding for and access to prevention tools like ART for people living with HIV, VMMC and PrEP that can reduce rates of new HIV diagnoses and deaths. Our core partners in this effort work in Kenya, Nigeria, Tanzania, Uganda, Zambia, Zimbabwe and doggedly track how data, resources and programs are put to use. Together we document shortcomings, reconcile promises with the facts on the ground, identify solutions and demand accountability. 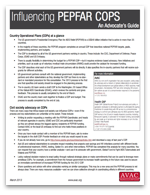 A two-page resource designed for advocates working in the US and in countries receiving PEPFAR funding. It contains background information and an infographic on how PEPFAR Country Operating Plans are developed and how advocates can influence them. These slides present an overview of the 2015 process for determining the country operational plans (COPs) for PEPFAR funding. Prepared for advocates, they outline steps and a provide background to inform engagement between government and civil society.